Find body marbling, free food and more at Life is Beautiful. Tucked away near the festival exit on Fremont Street near 11th Street, a serene experience awaits. In the daytime, Firmament, by artist Christopher Schardt, offers shade from the sun. At night, the canopy lights up with thousands of colored bulbs that sync to classical music. During “The Dance of the Sugar Plum Fairy,” the overhead canopy lights up as blue and violet jellyfish sway around the perimeter. After dark, move toward the middle and lie on your back to get the full effect. Find the Burning Man art installation on the lawn behind the Big Rig Jig. The Life Under The Wheel booth is the first festival appearance for the emerging nonprofit organization, which raises money to send patients of terminal diseases to the festival of their choice. Life is Beautiful is the group’s inaugural fest. Founder Elizabeth Pikaart started Life Under The Wheel to lift the spirits of adults coping with disease. “We send a patient and a friend or caregiver to the festival, all expenses paid, so they can have a weekend of music, dancing, community, fun and all the good things and not have to worry about their diagnosis for a weekend.” Visit the Life Under The Wheel booth to take a digital selfie in front of a ring light. Purchases for LUTW shirts and bandanas fund grants for future patients. This weekend’s unexpected chilly weather makes the cooling station better suited for escaping the wind and warming up. Located near the Downtown Stage on Stewart Ave. between Seventh and Eighth Streets, the cooling station provides entertainment in the form of foosball, ring toss and oversized Connect Four. Even better: The bar inside almost never has a line. 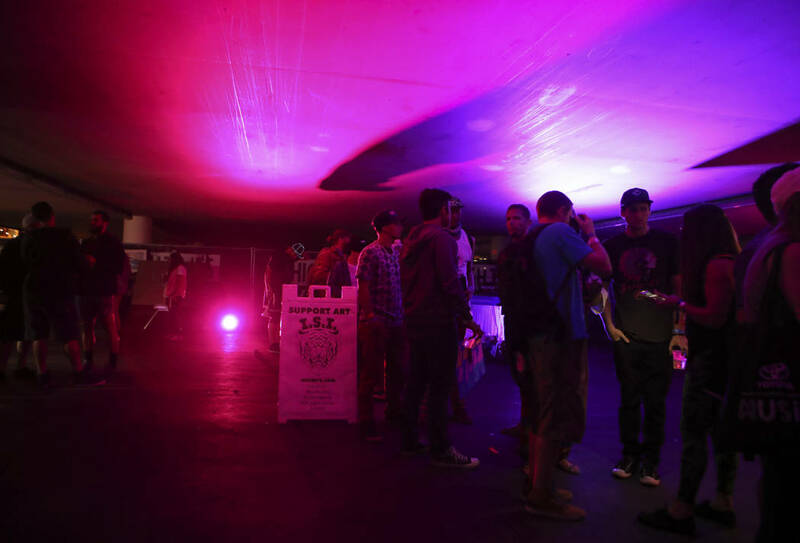 One floor up from the Cooling Station, the High Times Village offers unique entertainment. Many booths offer freebies by way of snack samples and interactive games. But one station features body marbling. A Black Light Visuals attendant will float your selected colors onto a vat of water, then dunk your arm in. The result is groovy, colorful and glow-in-the-dark. Downtown’s newest semiregular event, Market in the Alley, has moved into Life is Beautiful this year. The Marrakech-inspired market, set up near 11th Street Records, features artisan goods from more than 3o local creatives. Through 8 p.m., shop for everything from handmade jewelry by Mystic Herbs Shop to one-of-a-kind clothes from Twenty: A Sample Sale. If you’re dining on a budget, stock up on free eats. The Nothing But The Fruit Tasting Room offers free packets of Nothing But The Fruit fruit snacks. The Hansen’s booth hands out full-size cans of soda. Nearby, the Hubert’s Last Chance JOY Stop provides samples of lemonade and scoops of ice cream. Visit the Dove Chocolate kiosk for bite-size chocolate samples.